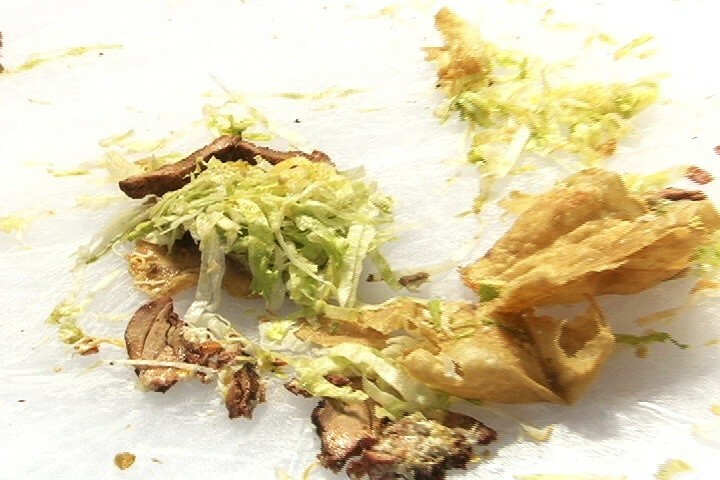 A destroyed lunch — taco salad? It worked like this: We would post a photo of a destroyed lunch from a local restaurant. Readers would guess what lunch it was, and we would reveal the answer with a video showing how the lunch was destroyed. In the first, Chauncy “The Hillyard Hammer” Welliver destroyed a BLT from Brooklyn Deli. “Looking back on it, I can't believe we got the green light to make Lunches & Punches, a pointless web series where we destroy local food in a creative way. Premise sounds simple but after you blow up a bowl of gumbo with a shotgun, destroying food becomes challenging. It started when I mistakingly overheard a conversation about lunches and naturally I butted in as a joke about a web series called Lunches and Punches all about destroying food. I teamed up with former Inlander staffer Nick Deshais, and we pitched it to the editor, Jacob Fries. He was not thrilled but I clearly remember him saying, "meh, why not?" Voila! Out of ambivalence, Lunches and Punches was born! With former Inlander staffer, Joel Smith, directing and Young Kwak filming, we did things that would make any fifth-grader jealous. I would love to bring back the series one day, only because I think sometimes we take things too seriously and can't be goofy. So Spokane, you bring the burrito and we'll bring the dynamite! After a few rounds of switching up our web systems, not all the photos made it through. But all the videos are still around. And we created a playlist of them all for your viewing pleasure.